This season, Curtis Sanford is leaving it all up to the fans. 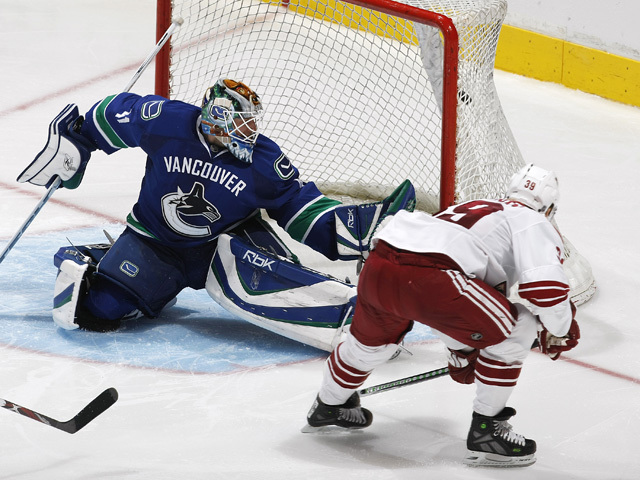 The power is in their hands, literally, as the Vancouver Canucks back-up goaltender has decided it's time for a new mask and he's leaving the design up to Canucks fans everywhere. 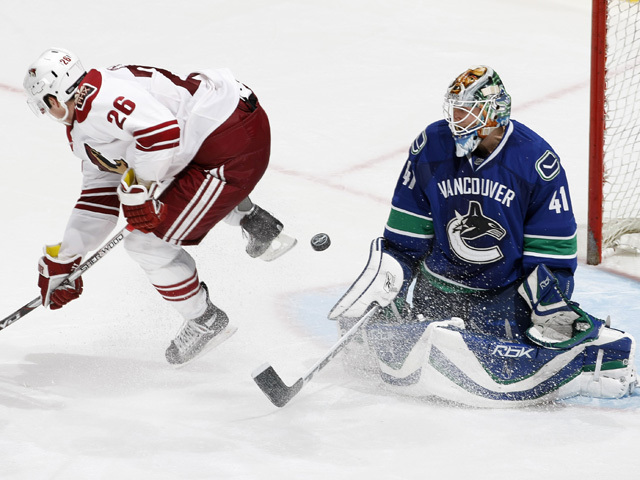 "I'm pretty much open to anything, I'm not too superstitious when it comes to what I have on my mask, I just hope that people come up with some pretty good ideas," said Sanford, who will be entering his second season with the Canucks this fall. 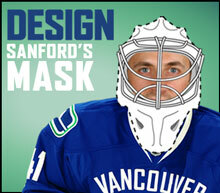 The Design Sanford's Mask contest, which ends at 5 p.m. PST on August 25th, gives Canucks fans the chance to not only create a one-of-a-kind design, but the top entries will also have their work showcased in a gallery on Canucks.com following the deadline. Sanford will then choose his favourite design and Ian Johnson of Excalibur Airbrushing will reproduce it with precision shortly after, meaning the netminder will begin training camp for the 2008-09 season with the unique mask. The winning creator will have the opportunity to discuss their design with Sanford during a meet and greet and they'll also pick up an autographed Sanford jersey, but first things first, there's a design to come up with. 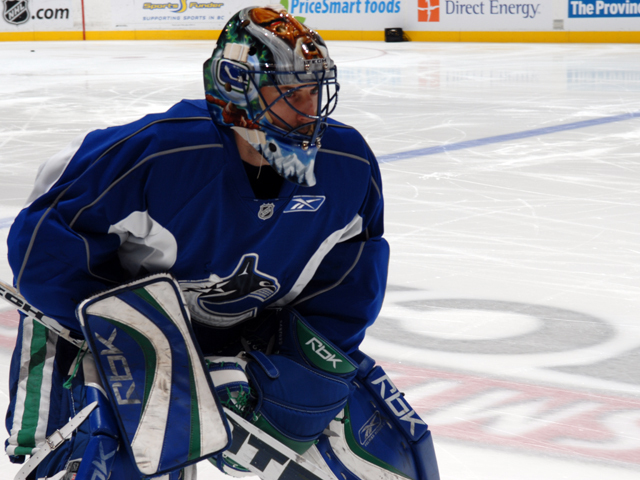 Sanford, who thought up this contest at the end of last season, has sported a popular Sandman image on his mask the last few years, this past season it featured Sandman's face on the top with a hand on each side. 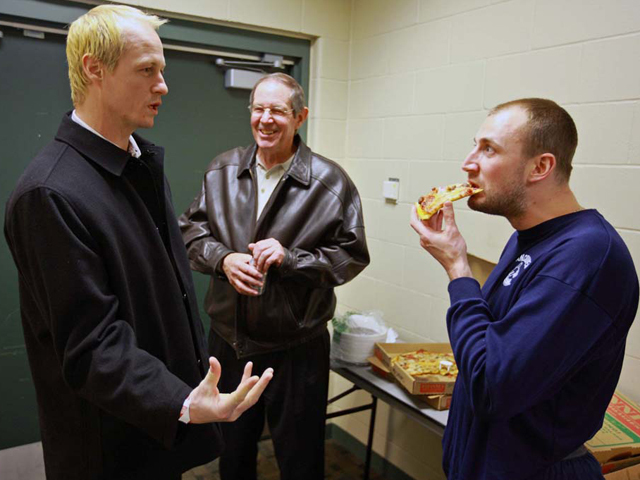 On the right Sandman is holding a staff with Vancouver's current logo, on the left he's holding a crystal ball with the team's original logo inside of it. The bottom had snow-capped mountains and trees under a night sky. Dubbed Sandman early in his career while a member of the American Hockey League's Worcester Sharks, Sanford wasn't too taken with the nickname at first, but he grew into it and it led to the design on his mask. 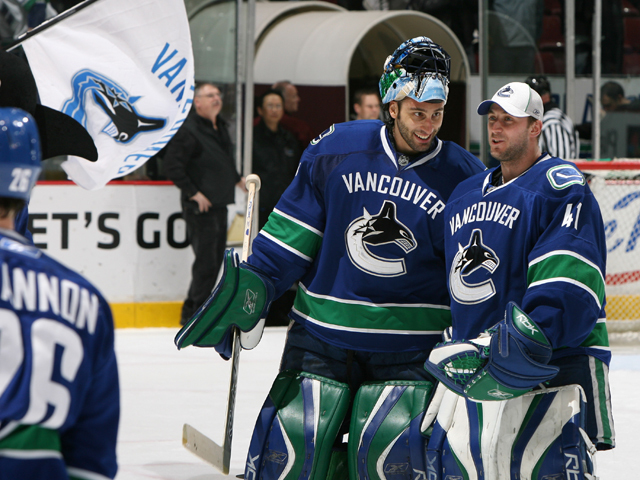 "My wife actually thought of the whole Sandman character idea and I've kind of used it for the past four or five years, I had it in St. Louis, then last year we added the mountains and the trees and obviously the logos to incorporate Vancouver. It's been a pretty good design, but sometimes you just have to try out something new." Something new is exactly what Sanford is going to get on his new Itech mask; he doesn't plan on submitting a design of his own so whether fans go with a classy and stylish look or a rugged old-school print, Sanford is excited to see it. "I'm looking forward to all of them as long as they are tasteful and everything. I'm pretty excited to see what people have in mind and to see what kind of creativity is out there." 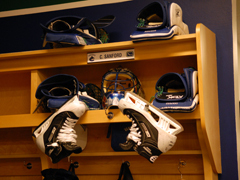 The design should incorporate the Canucks into the mask and an influence of Vancouver, British Columbia or Canada might not hurt either, other than that Sanford's mask is a blank pallet. Some of Sanford's all-time favourite goalie mask designs include the stitches that covered the mask of former Boston Bruins goalie Gerry Cheevers, the picture Pittsburgh Penguins keeper Dany Sabourin has on his mask of his two-year-old daughter and almost anything that Dallas Stars goaltender Marty Turco has worn the past few seasons. There is only one stipulation to the contest, only the front of the mask can be tinkered with, Sanford has reserved the back panel for himself. That area will feature a good luck symbol and his family's initials. As mentioned, Ian Johnson of Excalibur Airbrushing is the airbrush artist who will be bringing the winning creation to life. The 25-year-old is no stranger to the mask painting industry, he's been in business for five years now and has done work for Fredrik Norrena of the Columbus Blue Jackets ? he painted him a lion head ripping through the Finnish flag with claws on the side tearing at it and pulling the flag apart for the World Ice Hockey Championships a few years ago ? 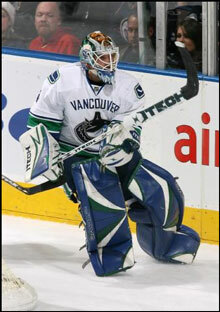 not too mention a host of other netminders throughout the WHL and BCHL. 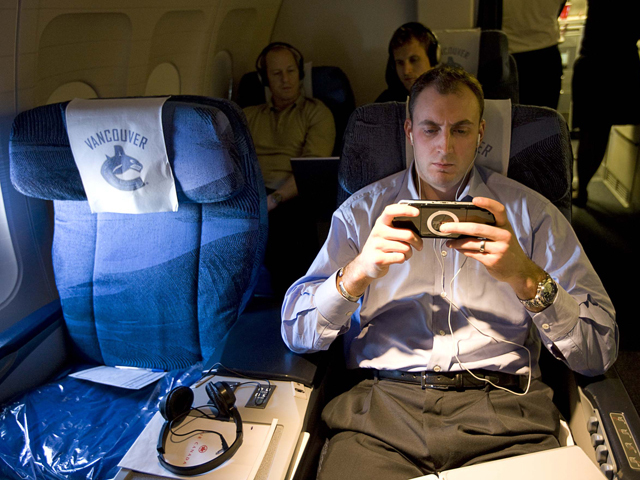 There's no disputing that this will be Johnson's biggest project to date though, he's feeling the heat too because as a Canucks fan he wants to do Sanford proud. "I would definitely say that there's some pressure because it's my paint job out there and I want everyone to like it," said Johnson, one of only 23 Itech certified airbrush artists. "I think Curtis has some good taste with his helmet so I'm a little bit relieved, but at the same time I'm a little bit worried about what somebody might design and how it might relate to the airbrushing." Fear not, the Design Sanford's Mask entries are sure to be original, creative and innovative, just like Sanford himself. Only he could come up with such an inventive contest. "I'm pretty excited to see where this goes and hopefully there are a lot of designs to pick from and we'll get it narrowed down and pick the best one that we think is deserving of it," said Sanford. Good luck everyone, may you become one with your inner Picasso. Click here to go to Sanford's Interactive Workbench and get started!